Everything began with a blog. Before starting my food blog in 2009 I would write with pleasure when required, I would cook with abandon at every possible occasion, but photography was not my thing. 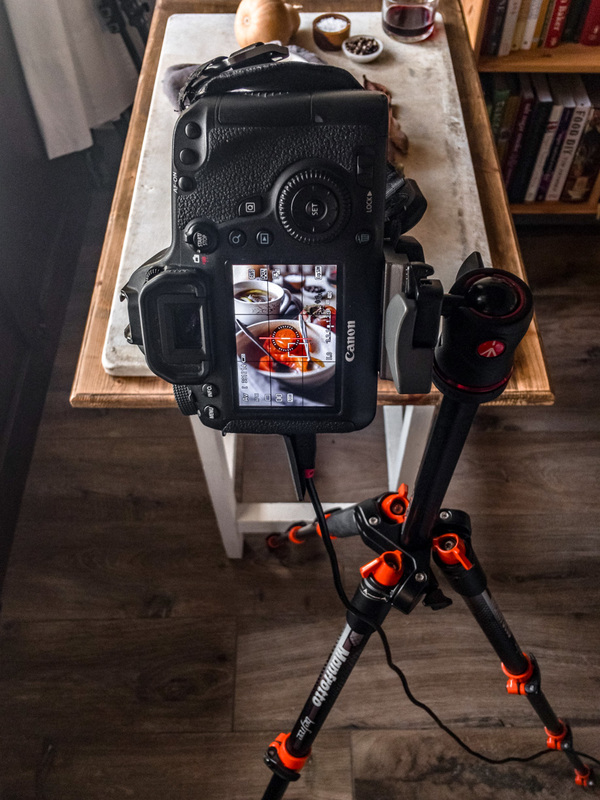 I am a self-taught food photographer: I learnt to take acceptable photos through practice and looking at the work of photographers that most inspired me. I soon realized that having a good selection of props can help you in taking a better photo, though I learnt through trial and error that you don’t need to overcrowd a picture with props to make it interesting. Now that Autumn has come to change colours, lights and moods of our photos, we can adapt our style to the new season. I thrive in the warm Autumnal hues, with the heart-warming food and ingredients, the flaming foliage of woods, the smell of fireplace and rain. 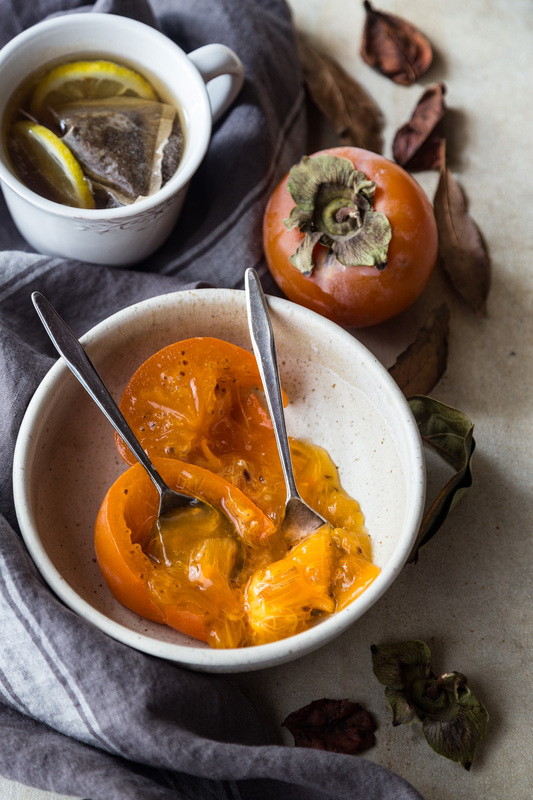 Let’s see how we can capture eye-catching photos using Autumn ingredients as main props. 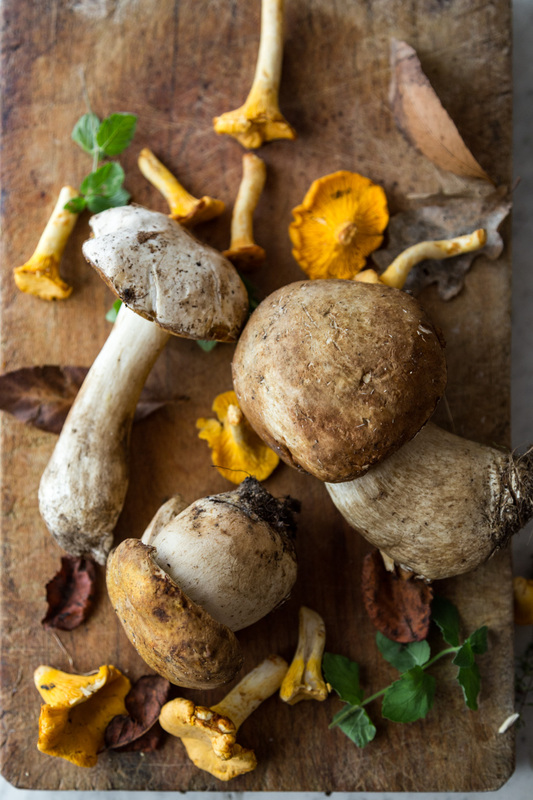 Autumn is usually associated with the warmth of wood: the foliage of forests, the logs burning in the fireplace, the brownish colours of typical ingredients such as mushrooms and chestnuts. You can opt for wooden backgrounds to complement the colours of these ingredients: a bare table or a cutting board could work magic and suit perfectly the tones of porcini and chestnuts. 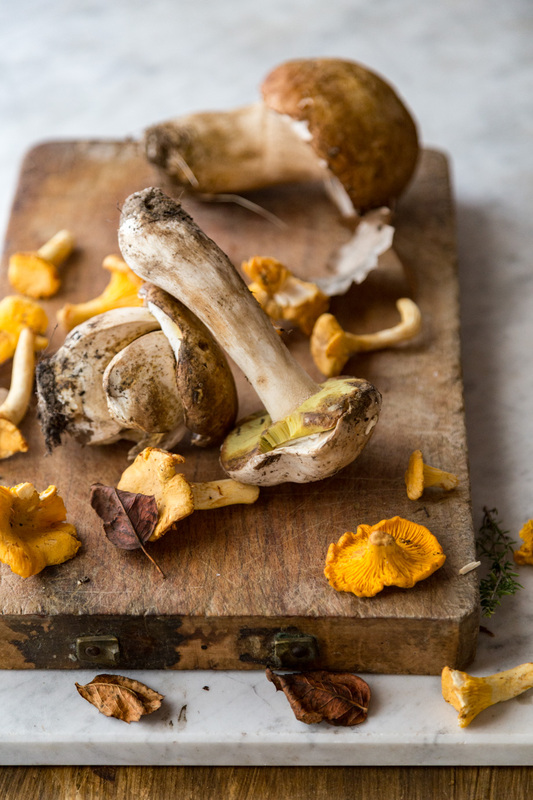 To add movement, play with the shapes of porcini, add the bright coloured chanterelles and fill up the scenes with dried leaves, which reminds an underwood scene. Chestnuts are another great ingredient which is a prop in itself. With a small, sharp knife cut an x in each chestnut, on the belly. 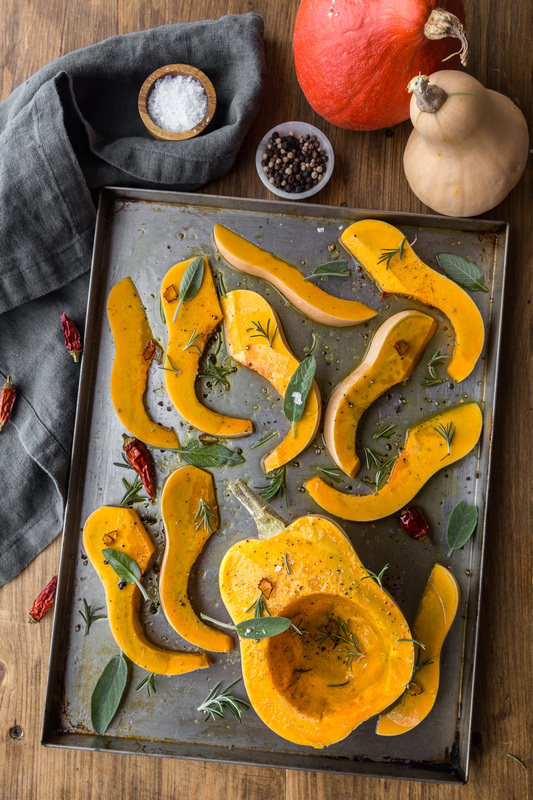 While they are roasting, on a traditional cast iron pan with holes on the fireplace or in the oven, they will open up, revealing the golden pulp. From here you need just a few more objects to take a great photo, as the roasted chestnuts are already a fascinating hero. 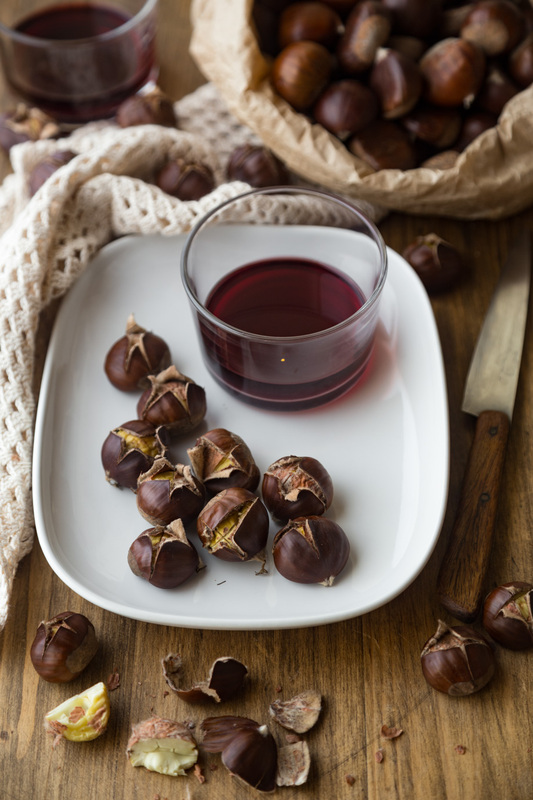 Add a more chestnuts in brown paper bag, which reminds of the roasted chestnuts you can buy at the crossroads in winter, and a glass of red wine for a warm autumnal photo. After summer, when all you search for is freshness, Autumn is the season when spices return in your kitchen. 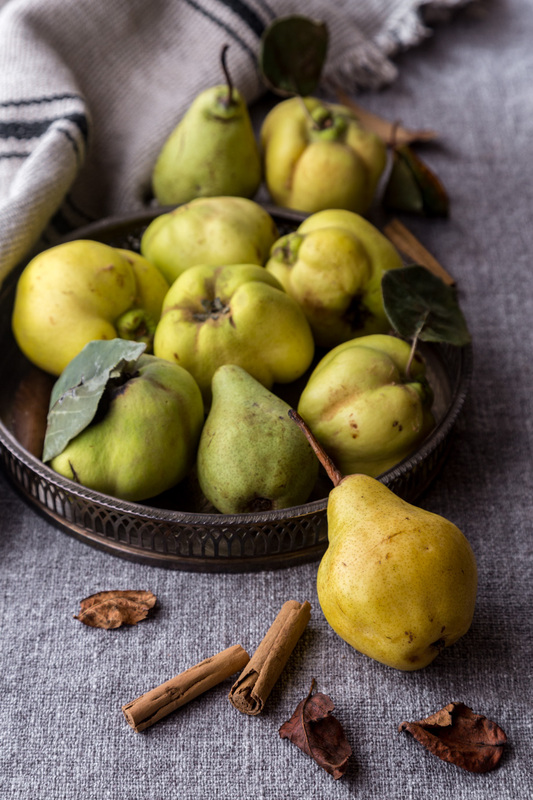 They can add colour and interest in a simple still life of quinces and pears. Quinces are the absolute star of this shot thanks to their knobbly shape, which captures light and is softened by shadow. In this shot cinnamon helps also to tell a story: you easily associate it to jams, compotes and stewed fruit, to the warmth of a muttering pot on the stove, to the pleasure of morning toast with butter and jam. Autumn is also the season of bright orange pumpkin and butternut squash. Even though in Italy we do not have the tradition of going to a pumpkin patch to choose the perfect squash to carve for Halloween, the orange hue is an almost constant presence in our kitchen comes October. 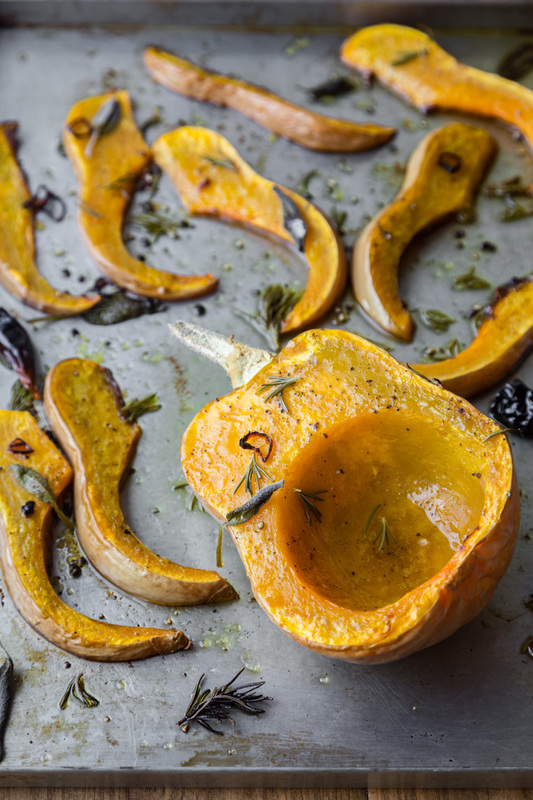 Pumpkin and squash, just like quinces, steal the scene with their curves, so the styling of the picture requires just some playing with their shapes, a drizzle of olive oil to add an interesting glistening, a sprinkle of black pepper and salt and some fresh herbs scattered around. Cut the squash in different shapes to add movement and surprise the eye. Autumn light can be the softest warmest light, but it always disappears too fast. 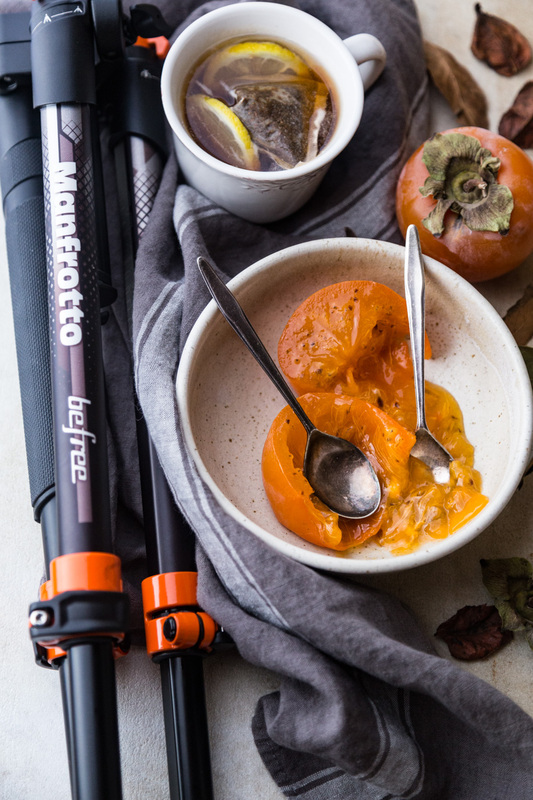 Spoiled by the long Summer hours of daylight, if you shot mainly with natural light you can appreciate a handy tripod like Befree Orange, which completely suits the Autumn colours and will help you have a steady hand when shooting your last picture of the Autumn assignment. The blog. Juls’ Kitchen transports you to a Tuscan kitchen, showing you the honest and seasonal food of Tuscany in beautiful photography. Giulia tells you the stories that are often the inspiration behind a recipe. Rigorously tested, these recipes give you detailed and uncomplicated instructions to recreate a little bite of Tuscany at home. Giulia’s mission is to inspire people to cook simple meals where the quality and freshness of the ingredients shine through in every recipe. She loves nothing more than to receive word from readers who successfully recreated her recipes. After all, Tuscan food is all about sharing and passing on knowledge. The blogger. 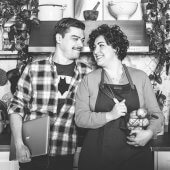 Juls’ Kitchen is written and shot by Giulia Scarpaleggia and Tommaso Galli, who are also partners in life. Both were born and bred in Tuscany. Giulia is a food writer and photographer and she teaches Tuscan cooking classes in her family house in the countryside. She started her blog in 2009 to collect family recipes and stories. Tommaso joined the team in 2015 when he moved in from Florence. He now loves the country life as much as he loves Giulia’s food. He is the tech guy and the video maker, besides being the head tester at Juls’ Kitchen. Giulia is born and bred in Tuscany. She is a food writer and photographer and she teaches Tuscan cooking classes in her family house in the countryside. She started her blog, Juls’ Kitchen, in 2009 to collect family recipes and stories. She has written 5 cookbooks.